IT administrators often need to know who logged on to their computers and when for security and compliance reasons. Although you can use the native auditing methods supplied through Windows to track user account logon and logoff events, you may end up having to sift through thousands of records to reach the required log. Once you’ve found the required log, getting the required information for compliance and security reports is not an easy process. In this article, you will learn how to audit who logged into a computer and when. You will also learn about an easier way in which you can audit logon/logoff events with LepideAuditor. Audit Logon Events: This setting generates events for starting and ending logon sessions. These events happen on the machine where you log in. Audit Account Logon Events: This setting generates events on the computer that validates logons. When a domain controller authenticates a domain user account, events are generated and stored on that domain controller. Open “Group Policy Management” console by running the “gpmc.msc” command. If you want to configure auditing for the entire domain, right-click on the domain and click “Create a GPO in this domain, and Link it here…”. Create a new GPO dialog box appears on the screen. Enter a new GPO name. Go to the new GPO, right-click on it, and select “Edit” from the context menu. “Group Policy Management Editor” window appears on the screen. In the navigation pane, go to “Computer Configuration” ➔ “Policies” ➔ “Windows Settings” ➔ “Security Settings” ➔ “Local Policies” ➔ “Audit Policy”. 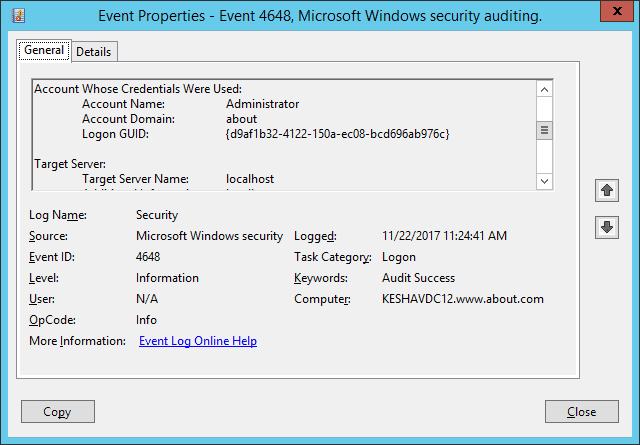 In the right pane, double-click “Audit logon events” policy to open its properties window. Select the “Success” and “Failure” checkboxes, and click “OK”. Similarly, you have to enable “Success” and “Failure” for “Audit Account Logon Events”. Close “Group Policy Management Editor”. 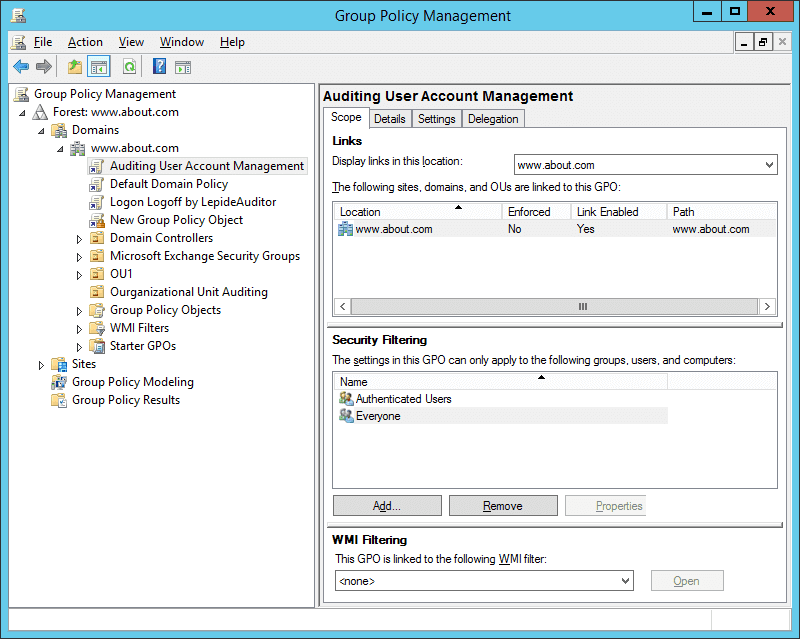 Now, you have to configure this new Group Policy Object (containing this audit policy) on all Active Directory objects including all users and groups. Perform the following steps. 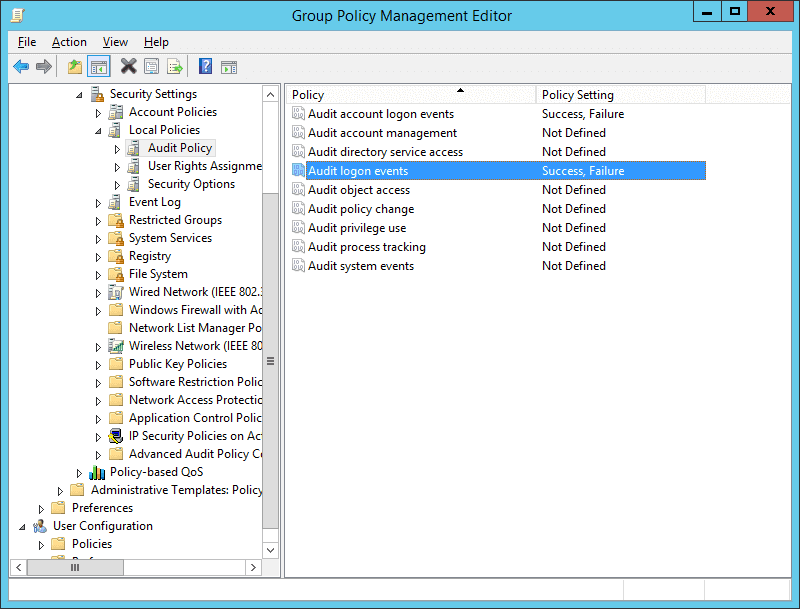 In “Group Policy Management Console”, select the new GPO (containing above change). In “Security Filtering” section in the right panel, click “Add” to access “Select User, Computer or Group” dialog box. Type “Everyone”. Click “Check Names” to validate this entry. Click “OK” to add it and apply on all objects. Now, run following command to update GPO. Go to Start ➔ Type “Event Viewer” and click enter to open the “Event Viewer” window. In the left navigation pane of “Event Viewer”, open “Security” logs in “Windows Logs”. You will have to look for the following event IDs for the purposes mentioned herein below. For user logon, you have to search for 4624 and 4648 event IDs. For failed logon, you have to search for 4625. For logoff events, you have to search for 4634 and 4647. In this article, we are searching for events 4624 and 4648. The following screenshot shows Windows Event ID 4648 for the user logon attempted using explicit credentials. In this article, the steps to audit the user logon and logoff events through native auditing are explained. However, much noise is generated for the logon or logoff events that make it complicated for the IT administrators to have a real-time view. The easiest and more efficient way to audit the same with LepideAuditor has also been explained. 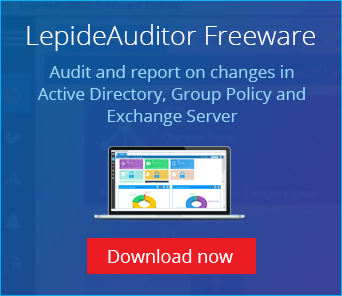 To try LepideAuditor for yourself, download the free trial version today.